Gauntlet Birds of Prey in Cheshire (Postcode WA16 0SX) is a great place to take the kids for a day trip for all the family. 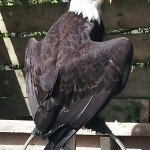 Here’s what to expect when you get there – our review of Gauntlet Birds of Prey is based on our own personal actual visit to the site. On arrival you will pay the Gauntlet entrance fee, they offer prices on an individual basis or a family ticket option which works out less expensive. The friendly staff will provide you with leaflets and a competition sheet for the children to complete as they tour the grounds, basically as the kids see a sign on a wall which is comprised of the letters of a bird of prey name all mixed up, they match it on a card/sheet and get to place an inky stamp on it to show they have found a match. You will be told what is on offer on that particular day (such as their family shows, feeding times and predatory bird introductions) and at what time these events take place. First impressions were that it is a very organised setup – and we weren’t disappointed. At 11.30 (am) a very professional guide talked us through the difficulties experienced by the vulture population in the wild, this was extremely informative, whilst disheartening, as their numbers are declining due to horrendous poaching issues in the wild. It isn’t that the vulture is being poached that is the cause of the problem of the declining numbers of birds, more so that the poachers are lacing the carcasses of dead animals, such as Rhino and Elephant, with Cyanide to kill off the vultures. Their goal being to get rid of the population because as they circle overhead waiting for their meal, the birds give away the position of the poachers illegal activity thus attracting the attention of authorities such as police and wardens in the area. In addition to the tragedy of the information given, the guide also makes the presentation humorous with tales of the Vultures personalities and antics which brings us closer to the birds and provides an understanding that these are intelligent creatures and should be treated with respect and also cared for. Following this, we went to the first Gauntlet bird show, where visitors are invited to take a seat in a completely open air area on benches overlooking a large field with various tree stumps and platforms in it, for the stars of the show (Vultures, Falcons, Owls and Eagles primarily) to land on and fly to and from. A guide (who is involved in conservation work, around the country and beyond, for the birds and highly knowledgeable in both the ornithology and individual personality aspects of them performs a spectacular display getting them to perform tricks and chase food. During the show visitors have to duck and dive out of the way of the swooping birds as they fly from one tour guide to another – skimming over the heads of the spectators. They glide so close that you can actually feel the wind from their wings as they pass by. It is truly an amazing experience for both old and young alike to have such majestic predators sweep past at high speed, and at the same time we are reassured that they won’t bite and that everyone is perfectly safe. Some of the birds come hopping over to the seats as they are naturally inquisitive which allows visitors to get up close and see their coloured wings and feathers in maximum detail. During the exhibition, the guide explains in more detail the problems faced by the vultures in particular, and explains how we can help by spreading the word about Gauntlet Birds of Prey with the aim of raising awareness and potential further raising of funds for expansion. Additionally though, the pace is fast and entertaining with falconry explanations and stories of individual bird personalities, preferences and background history. There is a small snack shop selling hot and cold drinks and things like pot noodles, however if you require something more substantial you can always take time out and go to the garden centre next door which has a larger cafe. Although we settled for what was on offer as this would help contribute in some small way to the business. After a break, there was another session which involved another experienced member of the Gauntlet team showing us various birds whilst she had them on her gloved hand at this point we were allowed to stroke some of them as she walked round the group. This session was known affectionately as the Meet and Greet part of the day. Facilities for hand washing are available at various points along the enclosures and people are advised to wash after touching the birds. Perhaps the highlight of the day was a final display of around 25 birds, including Kites, Vultures, Eagles, Owls all flying around in the same area (completely outdoors with no restrictions on the freedom of flight at all). This section again included feeding and close up encounters with various feathered friends as they explored the area and worked their magic. There is a play area for kids aswell which fills in time between displays (not that there was much time available as there is plenty to see and learn as you walk around). All in all – this was a memorable and great day out, we were there for around 5 hours in total and it was such a fun packed adventure that the time literally “flew” by (no apologies for the pun). 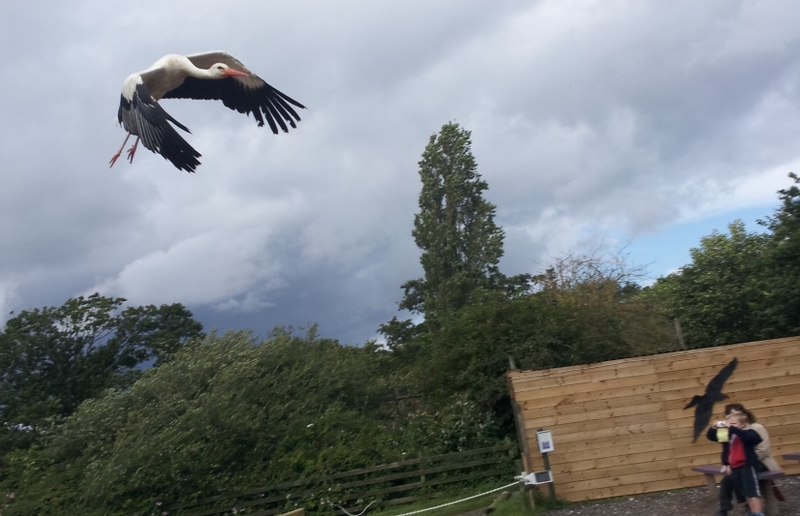 We will definitely be going again and would highly recommend Gauntlet Birds of Prey as an attraction which is more than worth a visit. - Great Bird Flying Shows. - A Huge Range of Birds. - Ideal for Young and Old.